In 1966 Ferrari offered several models: the family orientated 330 GT 2+2, the stylish and appropriately named 500 Superfast, and the performance orientated 275 GTB. However, Ferrari found themselves with a gap in their line-up. At this time Ferrari did not offer a model which combined a blend of performance, luxury and styling into a single model. The last car to do this was the 250 Lusso which ceased production in 1964. 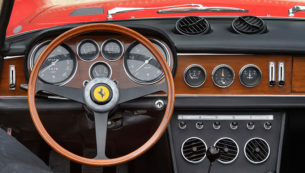 To fill this void in their range and to cater for the American market which demanded a more sumptuous interior, Ferrari developed the 330 GT which debuted at the 1966 Geneva Motor Show. The new two-seat Grand Tourer offered both elegant styling and, as always, blinding Ferrari performance. Two years later, in 1968, the 330 received a performance boost with displacement increased to 4390cc giving each cylinder a capacity of just over 365cc, hence the name change. The up-rated Colombo V12 now offered 320 horsepower and a brawny 267lb-ft torque available from low RPM. 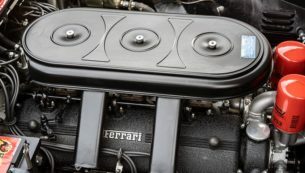 This was a significant increase over the previous generation car and made the 365GTC (and its alluring convertible sibling, the Ferrari GTS) the most powerful single overhead cam engine ever used on a Ferrari. 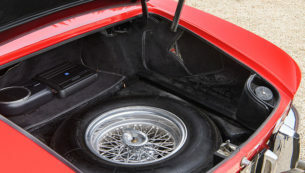 The Pininfarina body remained cosmetically very similar, except for the engine-cooling vents on either front wing which moved to the top of the bonnet. This Ferrari 365 GTS, chassis 12269, is the 8th chassis of only 20 spiders built, making this car one of the rarest series production convertible Ferraris ever made. In comparison, the 365 GTC was positively mass produced with some 168 cars built. Like all the best Ferraris, the 365 GTS was produced in left-hand drive only, further adding to the unique nature of this car. However, by the early 1970s, emissions regulations coming in to force in the US spelled the end of this body shape and so Ferrari’s final take on the car that first appeared in 1964 ended prematurely. Production of the 4-cam Daytona spider began in 1971 with a reduced compression ratio and modified exhaust system for the American market. The Ferrari 365 GTS now offered for sale at The Classic Motor Hub is a fine example, well maintained by known workshops and Ferrari dealers throughout its life. In 1969 this Ferrari 365 GTS was delivered new to official Ferrari dealer M.G. Crepaldi in Milan with Azzuro blue over Nero interior. By 1983 the car had passed to Leone Russo of Milan who had the car repainted red but maintained its black interior. The car then passed through 2 further owners before being sold to Araldo Pietro Fantini, a Swiss banker living in Zurich in 1984. Fantini then had the engine refurbished by Autofficina Sauro in Bologna in 1984. Remarkably, Fantini and the car’s previous owners had restrained from the pleasure of driving the car too much because by October 1984 an advert placed in Ferrari Market Letter listed the mileage at just 48,0000kms. Fantini placed several other adverts for the car over the next 9 years but never actually sold the car. Thanks to this, a reliable record of this car’s use exists and by July 1992 the odometer read just 51,000kms averaging to a sparing use of barely 2,000kms per year. The next owner, Eric Glorieux of Harelbeke, Belgium had the car fully restored and repainted black with a light green interior. Mr Glorieux had the car serviced regularly by Garage Francorchamps AS in Brussels-Zaventem and on 7th May 2008, renowned Ferrari historian Marcel Massini gave a preliminary report on the car before being bought by Martin Chisholm on behalf of a close client at the Bonhams Monaco auction on 10th May 2008. Later the same year Marcel Massini issued a comprehensive report on “12269” which details the life of the car since delivery and is available to see in the accompanying history file. Massini also managed to track down certified copies of the car’s first Italian road registration documents detailing the first 4 license plates the car carried and historical photos of the car when wearing its first red body are available on a CD in the Massini report. Overall some 325 photos and document scans accompany the report. In recent years this Ferrari 365 GTS has resided in the Cotswolds where it has been part of an important private collection. The new owners elected to have the car fully restored by Peter Chambers Automotive, which included a full bare metal respray and a return to classic Ferrari red with a complete rebuild of the engine as well as a new clutch being fitted. In addition, all worn braking and suspension components were replaced or refurbished. Photos and invoices detailing this most recent restoration can be seen in the history file. In the last 3 years, the car has been looked after by marque specialists Bob Houghton and GTO engineering who have taken care of every mechanical need. Thanks to their skilled work the car performs just as well today as it did when it left the factory gates nearly 50 years ago. With only 20 such cars built, the Ferrari 365 GTS is significantly rarer than the California Spider, Daytona spider or Pininfarina Cabriolet. As such this model is rarely offered for sale and the opportunity to enjoy the torquey performance of this exclusive Ferrari must not be missed.